It's called the Coachella Valley Music and Arts Festival for a reason: large-scale artworks set the festival apart and add immeasurably to the experience, and to the event's distinctive appeal. 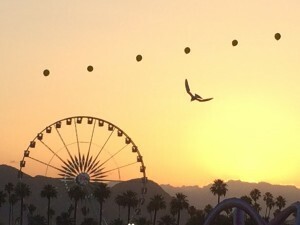 Art isn't the reason Coachella sells out even before the lineup of bands is announced, but it's far from an afterthought – this year, according to some reports, Coachella doubled its budget for art installations. It was also the first year that artists were named on the poster, yet also, curiously, the first year artists were told not to display their names alongside their works, making it one step harder for all but the committed to learn about the people who make the fest's unique visual landscape what it is. Here's a sampling of the art installations that Coachella visitors were treated to in 2014. Artist Philip K. Smith describes using the desert as material and medium for his art, and Reflection Field is a continuation of that practice, used most famously in his lonely piece Lucid Stead. Created from an abandoned shack on his property in Joshua Tree, Lucid Stead was an online hit, but only saw about 400 visitors in person. Contrast that with the 90,000 who attended Coachella and stood before the mirrors of Reflection Field and you have a wholly different experience. Much like the mirrors of Lucid Stead reflected the raw and empty vastness of the desert, Reflection Field served up not only an alternate perspective on the blazing skies above the polo fields but also the people who were fortunate enough to weekend there. Whether snapping their reflections in the mirrors by day or their LED-lit silhouettes at night, concert-goers treated Reflection Field as Grand Selfie Station at an event that often seems like the selfie-est place on earth. There's a joy in that, of course, and scores of treasured photos of gleeful friends will feature Smith's work as backdrop. But more importantly, the installation brought about an opportunity, for those who took it, to contemplate one's own place in the larger environment. The immense moving astronaut sculpture certain to become the central visual touchstone of Coachella 2014 featured three different video systems: a reflection cam pointing downward, seeing what the astronaut sees; a camera that, during randomly chosen intervals at the fest (and also at Instagram hashtag #missionpk14), puts your face into the astronaut's helmet; and one displaying prerecorded video images. The first two create an opportunity for selfies on the grandest of scales, but the last is what gives the work its deeper meaning. The work juxtaposes images of the planet in both its most beautiful and its most polluted states. 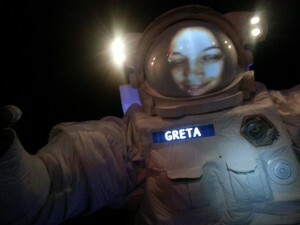 Shearn says that the astronaut is a traveler from the future, and both states reflect alternate possibilities for the world he may have seen. 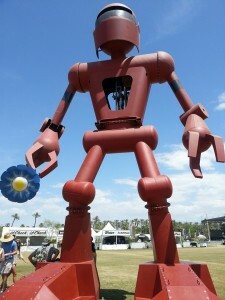 The fully kinetic sculpture, whose arms, wrists, and shoulders are radio controlled, has a high degree of interactivity that Shearn hopes will expand its life beyond the boundaries of Coachella, and the artist says he has already fielded a number of inquiries from educational museums that have expressed an interest in giving it a home. But Shearn is currently in search of a benefactor who can help move the astronaut from the polo fields to the kids he ultimately hopes it can be used to instruct. In the tony westernmost reaches of Empire Polo Club, artist Teale Hatheway's handpainted tipis rim shady Lake Eldorado in tangerine, gold, chartreuse, magenta, blue, terra cotta and cream. The tipis, when laid flat, made a canvas 32 feet across, which Hatheway painted in a series of motifs: animals, stripes, feathery lashes, circles of color and variations on mandalas. Though tipis have their roots in Native American cultures, Hatheway made a conscious effort to keep her distance from the Coachella-fashion-trendy Native American imagery seen so often at the event: feather headdresses, turquoise-y zig zags, and the like. "Not being of Native American descent, it was important not to emulate another culture," Hatheway says. She adds that that as an artist whose specialty is paintings of architecture, what drew her to the project was the opportunity to "reverse engineer" her typical thinking. "I do two-dimensional paintings about architecture. But this project encouraged me to create three-dimensional structures. 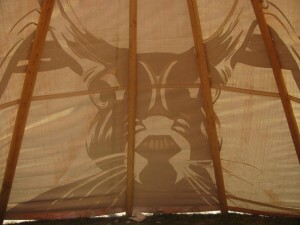 So the tipi became a formal shape as an influence on the overall project." Hatheway chose her motifs by asking herself how she could play with the shape of a cone and have the shape be dynamic. She also wanted motifs that read from a distance, from middle ground, and from close up, she says, "from a range of visual engagement." When Hatheway used animal motifs, she chose from local fauna – desert tortoise, road runner, damsel fly, coyote, jackrabbit, big horn sheep, haw, and, for fun, a jackalope. "The guys who installed the tipis said it was the most fun they had, because every time they pulled one out of the bag, they wondered what it was going to look like," she says. "They found it a treat. and that's so cool, because it's no small feat, installing all of those tipis." Consisting of two 50-foot-tall steel trees whose leaves are translucent cubes lit with LED's, artist Charles Gadeken's Squared is controlled by a live VJ. "Several patterns are generative or random, and there are inputs to allow the trees to respond to their environment dynamically as the music changes. 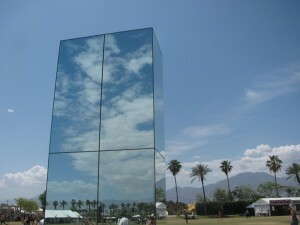 This makes Squared responsive to everything that happens around it at Coachella," Gadeken explains. Like many Coachella artists, Gadeken is a Burning Man veteran and an original member of the arts collective Flaming Lotus Girls. 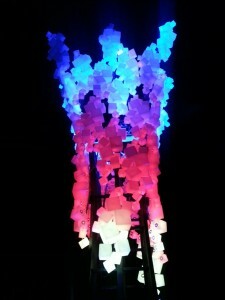 His light sculpture is capable of a number of visual effects: A crackling fire glitters as flames lick up one tall tree, while the second tree becomes a frozen iceberg with cracks that shatter across the cube surface. One cube starts to shimmer, and the sparkle wave catches on, sweeping across the whole tree. The sculpture also included a base of interlocking benches capable of seating 300 people, making it a popular resting place for concertgoers who were ready to give their feet a rest but not their eyes. Artist relations manager Lisa Hasko, who began the local youth art tours of Coachella, with Sara Schniedeman, creator of Coachella Valley Art Scene, proposed to Coachella organizer Goldenvoice that the event get together with local high school students for an art tour of the event between the two weekends of the festival. Sarah then connected Goldenvoice with Raices Culturas, a youth arts nonprofit in Indio. Last year, the kids from Raices proposed to make their own installation here, and 2014 is the groups second year of creating a colorful backdrop for concertgoer photos. Paraiso was designed and painted entirely by the students, with lighting done by one of their teachers. "It's nice, because they were never really allowed into the event, and there was little engagement with the local community," Hasko says. "It became apparent that we could better engage the community, and this project came out of that desire." 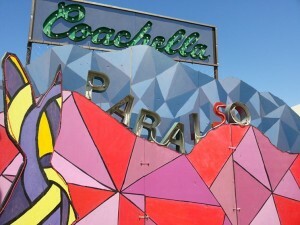 Schniedeman also created Coachella Art Studios, an on-site massive crafting space complete with DJ spinning music and different tables with materials and tools to make headbands, bicycle innertube bow ties, head scarf making, collage, zines, ribbons for ribbon dancing. Every evening, Schniedman and her crew undertook the considerable task of removing all of the tables and supplies and transforming the area into a chill space – a hot, difficult job in the desert heat. "But she's really motivated," Hasko says. "It's a big robot that smells a flower once every half hour." 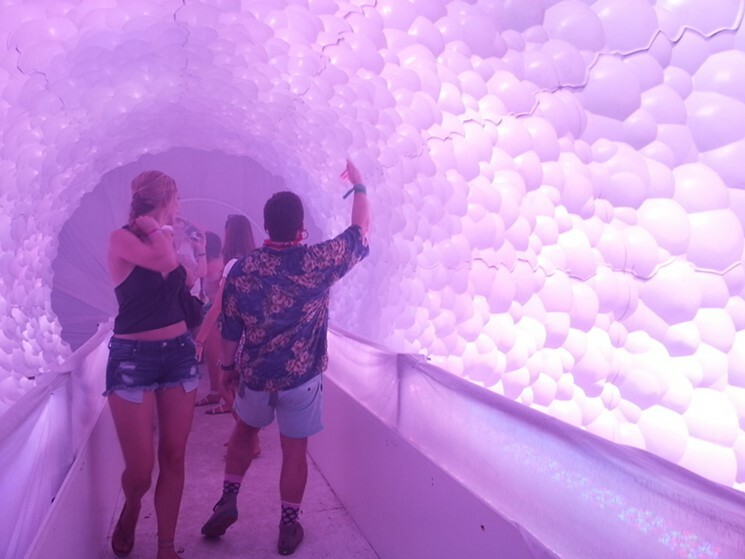 You have to push veteran Coachella artist Christian Ristow, who has been creating installations for the event since 1999, to say more about his 2014 creation, but not all that hard. "I have a 3-year-old son, and he was asking me to draw robots, and the more I drew them, the more simple, cartoonish and archetypal they became. At that point, I started thinking it would be fun to build something cartoonish." The flower-sniffing aspect of the work, Ristow says, was inspired by the classic children's book Ferdinand, about a bull who prefers smelling flowers to fighting matadors. 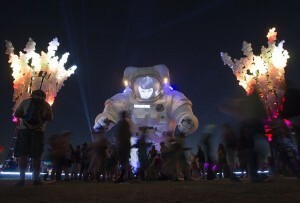 Ristow's previous robot-inspired works at Coachella include The Hand Of Man, a gigantic, menacing arm that could be used to crush objects in its metallic fist. In stark contrast, the daisy-wielding Becoming Human comes across as far more benign. "It felt like a natural progression on my art here, because the robots I used to bring here in the 90s didn't really meet the rigorous criteria of the word 'robot' – they weren't autonomous, or even semi-autonomous – and this one is even further from that," Ristow says. "The old robots were also cartoons of robots in the sense that they played on people's fears about what robots might become in the future. This robot is a more friendly vision – but still a vision, an idea, a dream." SmartBird by Festo AG KG & Co.
A radio controlled bird inspired by a seagull, the Festo SmartBird, which has a 6-foot wing span and weighs only 450 grams, is an engineering experiment designed to study the ways in which nature provides inspiration for automation technology. Andrea Ziomek of Festo explains that what makes the SmartBird unique is the fact that it is the truest emulation of natural bird flight that any model has achieved. "It literally only flies though the flapping of wings. Other bird models used something else driving them – helium, motors, etc. This bird flies exactly like a real bird, and also glides and flies." Steering is achieved through tail positioning. Ziomek says she's been amazed at how many festival-goers didn't merely look up, but peppered her with technical questions about the bird – which is a prototype and is not for sale. Part of the bird's mechanical success is due to "condition monitoring," in which the wings separate sections move in relation to one another, twisting as well as flapping, which is achieved through sensors. In other words, Ziomek says, one part knows what the other part is doing. Festo's other big project is a jumping kangaroo, which was designed to help learn about principles of energy storage. But will it show up at Coachella 2015? "It will be if Coachella invites us," Ziomek says with a smile. Resembling the spinning Hitchcock tunnel at the Universal Studios tour, artist James Peterson's CryoChrome tunnel, a walk-through installation that had long lines all weekend long, is far more disorienting than the amusement park version, because people walk, rather than take a tram, and the lavender-lit walls spin much faster. "You never get used to it," says artist Derek Doublin, who spent more than an hour in the tunnel while working on a video project. Peterson says the form was inspired by Russian ice caves, in which the light coming through thin ice creates extraordinary colors. "I wanted to capture that in a sculpture. It was all about trying to recreate that experience, particularly one that forces you to be in the moment. The disorienting effect really forces people to be present." Peterson says response to the piece has been nothing but positive. "It's one of those things where you know the magic trick, but no matter how much you know the magic trick, it doesn't matter. Your primal sense of space is disconnected. I find that to be one of the greatest experiences." 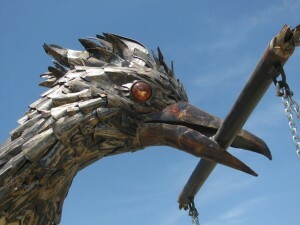 Made from sheets of plates of steel, galvanized sheet metal, with hand blown glass eyes, Road Trip, popularly referred to as the bird swing, is a sculpture of Geococcyx Californianas, or a road runner, holding a welcoming bench swing in its beak. 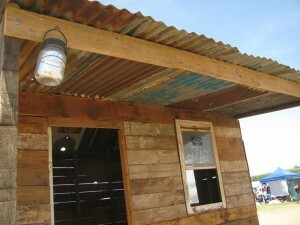 Kennell used a variety of metalworking techniques work to create the impression of differently textured feathers, some of which were upcycled pieces of metal scavenged from the side of the road – pieces of corrugated sheet metal blown off the roofs of barns. The key engineering challenge was keeping the structure safe and stable. So the bird is rooted the the ground with 42-inch anchors, and has a structurally engineered armature inside which keeps the bird in balance but "which allows drunken yahoos to swing wildly on it," Kennell explains. The swing is cantilevered over the legs, allowing for a a relaxing, contemplative moment, or a photo op, or anything Coachella might bring. "I love that in some ways, that swing is opposite of Coachella," Kennell says. "It's quiet, and people just sit there." When Goldenvoice came to Keith Greco with a folder of images of houses intended to define the "main street" of the campground, asking if he would be willing to build one or two of the houses, Greco said that he in fact wanted to build them all. "We twisted and bent a few of them, but they're kind of expected, so that's why I named it archetypes," he says. "They're almost an alphabet of house types." That list includes midcentury modern, bayou shack, popsicle stick, Lincoln log and gingerbread. "The proximity to each other, and the diversity of them, it kind of reminds me of some small gold rush town," Greco adds. "They came in, they put in a general store, they put in a saloon, and then everything filled in between a little temporary city. And for myself, my whole world is about nomadic structures." Since this was the first year for this sort of "main street" construction at Coachella, organizers weren't sure what to expect. "We kind of looked at it as an ant farm experiment, just, let's just see what people do with them," says Greco. What many people did, in fact, was graffiti, litter, dismantle, steal furniture, and punch holes in the walls. So some adjustments were made. For example, all stairs and ramps were removed, for the benefit of the self-regulation impaired. But Greco was in no way surprised or dismayed. He just saw the abuse of the houses as a fairly typical example of human nature. "They don't know why it's there, they don't know what it is, so they want to beat it up in some capacity," he says. "They were like monkeys throwing bones at a monolith."